Who needs stuffy old museums? 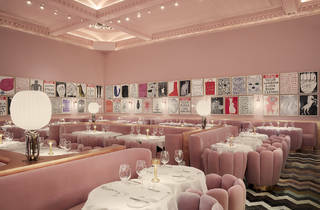 The dining room of the Gallery at Sketch is one of the most playful – and most pink – places to be enveloped by art. The walls have around 200 original prints and drawings by Turner Prize-winning David Shrigley, their cartoonish quality adding to the sense of fun. He’s even designed some of the crockery: ‘ghosts’, say the teapots, ‘forget about it’, quips the inside of your cup. You can come here for dinner, but afternoon tea is what The Gallery has become famous for, so much so that you can get it before noon (it starts, specifically, at 11.30am). Service is outstanding. Once your charming host has talked you through how it works, you’re looked after by a dedicated ‘tea master’: glam gals in slinky cocktail dresses and baseballs shoes. Who happen to really know their brews. After you’ve decided on drinks and a menu (standard, children’s or – if notice is given – a special dietary needs option), the fun begins. First, there’s the caviar man, in a panama hat and pale blazer. You get a spoonful of caviar (Russian Sturgeon, cultivated in France) alongside Egg and Soldiers: two slim, cheesy toast strips and a fake egg in a very real egg cup (the white is an exceptionally good Comté cheese mornay, the yolk is from a quail and cooked to an ultra-soft 63 degrees). There’s a similar level of creativity throughout the sandwiches and cakes. Star of the sarnies was a black bread Croque d’York, or the salmon and soured cream on rye, while a perfect pear tart and a caramel and chocolate éclair showed the skill of the pâtissières. After still-warm scones, it’s all finished off with a wedge of Victoria sponge (pleasant, though not as good as the pastries). Before you leave, be sure to pay a visit to the egg-shaped loos, where birdsong is piped into every pod. After all these years, Sketch still has a kind of magic. Afternoon tea from £59 per person. Sketch's dusty pink Gallery is as beautiful in real life as it is in the photographs. Being no stranger to an Afternoon Tea (it's the 'go to' present when stumped for a birthday gift!) I didn't expect to be as wowed as I was. But the food was delicious, the staff were delightful and the toilets were strange. All in all, a perfect way to spend a Sunday Afternoon. More of an experience than a restaurant, like walking into a retro pink spaceship with Jetson girls as front of house in matching dresses. Out of my usual price budget but was very kindly taken by a friend for my birthday and felt spoilt rotten. The service was fabulous, the cocktails were delicious and of course the obligatory visit to the toilets was hilarious and instagram gold!. I have only been here for drinks and for an exhibition opening, but I was enchanted by this place. Every room is different from the other and makes you dive into an Alice in Wonderland kind of atmosphere, where surreality and reality are blended and indiscernible. 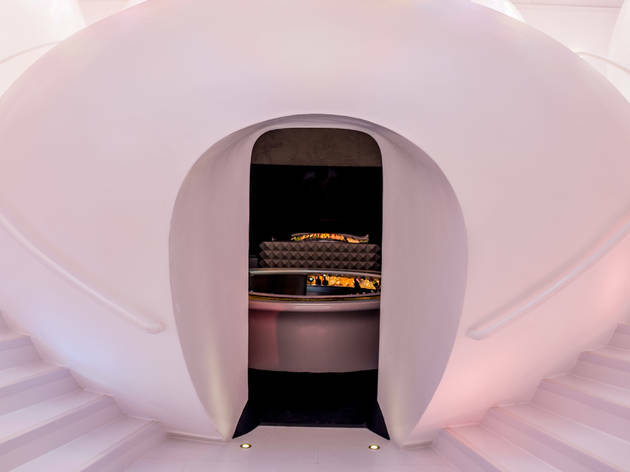 The decor varies from a velvety Rococò style in the green bar to space capsules containing the loos under a multicoloured curved ceiling, from the sophisticated baby pink dining room to neon lights in the bar at the entrance. Cocktails are a delight to see and sip. I wish I can try their Michelin starred menu soon! I didn’t know what to expect, except of Gallery room in blush pink velvet, walls filled with David Shrigley art and futuristic toilets…but it was so much more. Walking into sketch you are immediately transported to a different world. Hallways boasts in neon installations, dimmed lightening and soft music. Lecture room with its dark green wallpapers and incredible atmosphere left me speechless and before you know it I was in Library room, which was grand, with high ceilings, pink all around with cooper accents- it was much bigger that I expected it to be. People were already lining up to get escorted to their tables, some of them very openly taking photos of the restaurant. I’ve never experienced people taking photos in such obvious manner in a restaurant, but I guess Sketch is one of those places everyone comes to partly because they want to do that. Once seated at our table we were approached by sommelier and very helpful waitress that suggested which dishes to order. Wine went down well, food was incredible. Everything on the plate complemented each other so well, so full of flavour and very well presented on the plate. Sketch is a gem of a place! I had seen quite a few pictures of the main room before coming but was not expecting to fall so deeply in love with it. 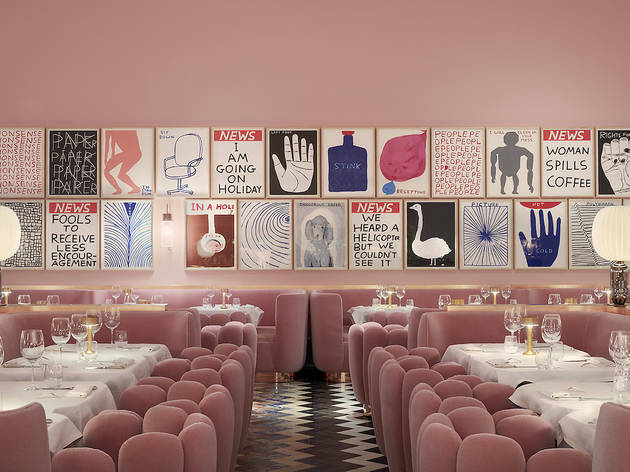 Shrigley's decoration makes the place both witty and welcoming, going away from the traditional codes of fancy restaurants and reinventing it. Food is paired with this great place, both innovative and unexpected, whether it is a poached egg with squid or a veal escalope with touches of lemon, everything is a discovery. It comes with a price but you don't have to do the full 3-course experience for smaller budgets and that will still be an incredible experience. I dined at the Sketch Gallery during the 2017 Chelsea Flower Show period. The entrance to the restaurant was beautifully decorated mimicking a flower garden. Upon entering the Gallery, I was impressed by the quirky pink décor. It felt like I was entering 'Alice in Wonderland' world. Service was a little slow. Food and drink orders were taken by separate waiters - Food waiter wont take drinks order and vice versa. Bread only came around 30 minutes after ordering, and appetizer roughly 20 minutes later, followed by main course. We had our main course 1 hour 10 minutes after we sat down despite us finishing the appetizer within minutes. Food was of good quality but expensive. I had steak and it was a decent portion, but it was served with a tiny side of potato croquette. There were 2 pieces of potato croquettes the size of adult little fingers with a few leaves. The cheapest glass of wine (175ml) was just under £10. You must visit the quirky toilet here, each toilet is located in an individual pod. The toilet attendant was dressed in a French maid costume. This restaurant is not a place to enjoy long meals in, it is more for impressing business acquaintances or dates. Ever wanted to try out a dish by a 13 star Michelin chef? Sketch definitely takes fine dining to the next level. But it’s certainly not just about the food in this quirky, classy and mesmerising Mayfair gem. With five dinning halls/bars on offer, each with its own style and vibe, you’ll be spoiled for choice. The Gallery is pink and grand, offering time travel back to the 50s/60s, with a very classy bar which will make you feel like you are on the Mad Men set. The mains are delicious and as unusual and eclectic as one might expect them in a Michelin star restaurant (think Iberico pork, caramelised sweet onion fondue, capers and kirsch ravioli) and the desserts something special altogether. With portion sizes resembling more a generous soup than a shy macaroon, make sure you leave plenty of room in your tummy for a sweet treat and prepare yourself for a very indulgent experience if you go for the chocolate option. With dinner behind you, head out to your bar of choice. You could dive into the Glade, a woodland bar mimicking an enchanted fairy-tale forest, with dim lights and amazing cocktails. Not feeling sufficiently romantic for the Glade? Head down into the East bar, cozy and vibrant, with DJs playing throughout the night and again enticing cocktails (if gin is your thing, I’d recommend ‘9 conduit street’). Sit back, relax and look around, you’ll soon feel as though you’ve entered a very classy space ship. Sketch really doesn’t leave anything to chance in terms of design, so you can imagine that a trip to the Sketch toilet will be an experience in its own right. The cubicles are not cubicles at all, but small futuristic white pods. The ceiling is decorated in multicoloured tiles and the mirrors distort the surroundings to add to the outer space sensation. Great for an evening out to remember, you really can’t go wrong with Sketch. 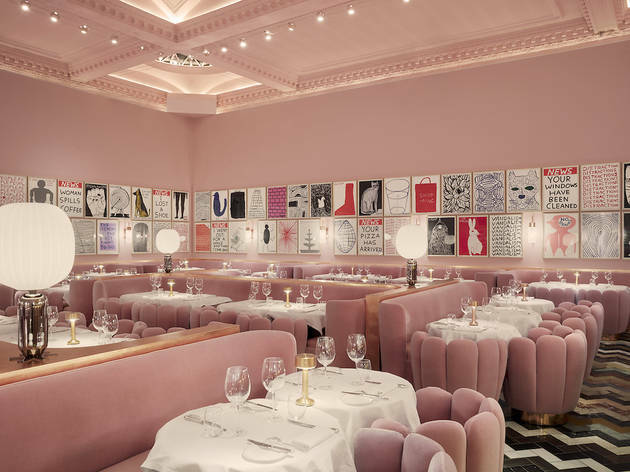 The sketch High Tea is something of a quirky ‘must-do’ in London due to it’s plush, Wes Anderson-esque interior. The walls are covered with art by David Shrigley and although not quite my style - very intriguing and quickly became a topic of conversation. The highlight was the black truffle croque-monsieur finger sandwich - fragrant and delicate. The scones and the coronation chicken finger sandwich also received a lot of praise for its presentation and the latter, for it’s texture. Unfortunately, the petite gateaux selection and the choux cakes were unremarkable and the tea, was a little flat and lacked fragrance. As there were no tea leaves in the teapot, we wondered if it had been pre-brewed and not freshly made. However, the service here are wonderfully dressed and attentive without it being too stuffy. Overall the atmosphere, art and architectural experience is what you go for (I’ll let you discover the bathrooms) and that triggers a curiosity in me to try their other dining areas such as The Glade - a lunch and afternoon tea area which is wonderfully designed (almost a Tim Burton’s Alice in Wonderland meets Gatsby); or the Lecture Room & Library which is a Michelin star dining room. Tip: Do get up and browse the art on the wall - I won’t say it’s beautiful, but it’s engaging, thought provoking and sometimes cheeky. Good For: dates, catching up with friends, special occasion, small groups, something different. What to say about Sketch? Well you've probably seen the photos of the gallery room, and the egg pod style toilets (if you haven't look below!). 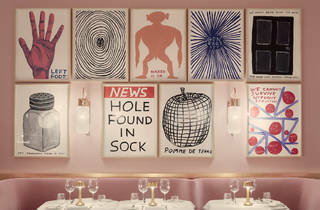 If you're a fan of David Shrigley you're in luck as his work graces the walls and plates and other items of tableware. But what about the food and service? Well if you scroll down this list there is currently a real mixed bag of comments, like marmite people either seem to love it or hate it, but I fall firmly into the love category based on our experience, as both our food and service was excellent. The food certainly isn't cheap but I think you have to accept that fact, as it is obvious from the menu, but as an overall experience I feel that they do deliver. My favourite touch was that they even re-folded our napkins every time we left our seats to visit the crazy cocoon bathroom pods. Dined at the Pink Galley and I have to say, the food was delicious, service attentive, and the general ambience lovely too. The toilets are amazing - they're like white space pods! inside a Wes Anderson movie... the location, the building and the design are amazing, in the restaurant everything is so pink and retró, every room is a new discovery! the food was good, but too too expensive. I didn't like at all that they need your credit card for the reservation, and if you have more then 20 mins delay they charge you 30 pounds per person! The space itself looks amazing, but once you sit down, you realise there is no windows and the tables are very close to each other. We felt like like we are in a canteen, the service was not much better, very slow and not that helpful. There are a few gluten free options, but I must say I have eaten better cakes, all a bit to sweet, no flavour, just sugar. Yes, the toilets look awesome. But I don't think the whole experience is worth the money. 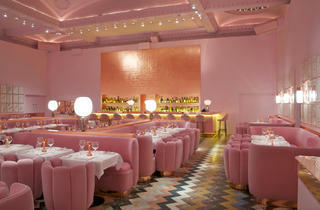 It's the most marshmallow-y, pinky, comfortably posh place you'll ever experience in Central London! What is there not to like about a room that feels like it gives you a huge hug when you enter it. The interior is equally as quirky as the rest of the building (the Parlour and the Glade are just as nice to experience) however the Gallery is definitely the 'treat' of all of them. The service is brilliant (as with the other places in here too) and nothing is too much trouble. Food is delicious and there something quite special about being surrounded by other people who are just as excited as you are about being engulfed in this pinkish-quirky-feel of a space. Food and drink is a little bit on the more pricey side but you most definitely get what you pay for - I would say the Parlour is my go-to place for visitors coming into London and something that's more of a casual occasion - the Gallery is definitely your souped up, fancy pants place and is worth every single penny! This year, I've had afternoon tea here twice. Once for my birthday. The second for my wedding. Both times were extraordinary. Though packed each time, I never felt like I was intruding on someone's space and I never felt that people were listening in on our conversation. The staff are exceptional. They're so attentive and helpful, efficient and friendly. It helps that the dining room is so pretty and unusual too. Now the food. The food is out of this world. The selection of sandwiches are so moreish that you'll have to take them up on their offer of refills. My particular favourite is the goats cheese toasty. Actually, the sandwiches are so good that I even wanted seconds of the salmon sandwich and I don't even like fish. The scones are rich and buttery and the pastries are a pure delight. Actually, writing this has made me want to go again. This has definitely got to be my favourite restaurant in London! The service was excellent, the atmosphere and decor is inspired and the food was amazing! We shared the duck main which was cooked to perfection. Make sure to check out the toilettes! Everything about the experience was perfect. I rang to book a week ago and I was told that I didn't have to book for the 'parlour' room therefore we didn't and I came today (we travelled 2 hours to come) and the woman at the front desk was so rude, she told me they were fully booked and I explained how I rang and they told me I didn't have to book I could come whenever and the woman said there's nothing they could do and acted in a very unpolite manor, I was very excited to be coming and had been looking forward to it for a while and had travelled just to go to sketch - I will not be coming back. Love the design of the whole building - from the entrance to the art on the walls, the other bars and snugs that you could peep into as you passed, of course the pod/egg toilets and especially the ambience of The Gallery. 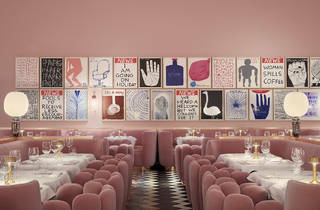 All dusty pinks with David Shrigley prints covering the walls. Staff were friendly and welcoming but service staff were overly attentive, quite 'faffy' and disruptive to our evening and flow of conversation. I am happy to pause the chat to place an order but to have clinking and clanking, interrupting me twice after I had placed my order and you had moved on to the next patron and someone leaning in front of you to pick up a glass or a crumb, personally I'd rather it was left so my experience feels more seamless. Food was great quality and my dish (fish and chips) was more filling than I expected, although my friend ate his risotto in about 4 fork fulls. Desserts and the cheeseboard are wonderful. Photo worthy and truly exquisite. Bill seemed very high and all things considered I would not return but am glad I gave it a go. Dined here on the recommendation of our trusted lead Tastemaker, Rosie Akenhead, and it did not disappoint! The restaurant itself is a work of postmodernist art, from the different bars, to the dining area, to the bathrooms. It certainly provides the most unique dining experience. And the food ... where to begin?! Starter of brown shrimps and crab meat en gelee looked and tasted exquisite, for main, I had the beef tartare which was equally delectable! My friend opted for the fois gras terrine and the veal pot au feu, as nice as his meal was, mine was the better choice! The staff were lovely and the cocktails were great, it is a touch pricey but totally worth it for a special occasion and for the experience. Yes, the décor is astoundingly cool and, yes, the toilets in Sketch are out of this world, but once the novelty of this super-hip Mayfair spot has lost its sparkle, is Sketch worth the hefty pricetag? The answer is a resounding yes. Sketch is not only an awesome dining experience, but its menu is a masterclass in high-end cooking and creativity. Firstly, the staff were exceptional. Every member of staff was friendly and attentive, without being intrusive, and all had a brilliant knowledge of the menu and were happy to recommend their personal favs. The Homage to David Shrigley, the artist who created the beautiful setting, was incredible; melt in your mouth tuna tartare, creamy tuna cream and a refreshing pea ice cream. The main courses didn’t disappoint either. The rack of Iberio pork with red cabbage jelly, sweet and fragrant red onions and ceps ice cream was delicious; the pork juicy and tender and the sauce packed with festive spices (maybe overpowering for some, but for a Christmas pudding fiend like me, was just right). The Angus beef was perfectly cooked with a chorizo and calamari garnish on top; divine. Unfortunately, we were too full from their amazing home-baked bread to sample the dessert menu, but there is a cinnamon French toast/caramelised pineapple concoction going on which I think will tempt me back. The wine list was eye wateringly expensive however their house wine, which is a reasonable £26, ticked the box just fine. Sketch is cool, undoubtedly so and the prices mean that this is a special occasion type of place. But believe the hype; the food is beautiful (to the eyes and the palate) and the quirky, fun setting makes it an all-round cracker of a restaurant. And, of course, make sure you visit the loos. My husband and I went to Sketch Gallery a couple of weeks ago and we had a lovely time. The service from the moment we walked in was spot on, all staff were so friendly and prompt with pouring water, clearing the table and ready fro when we needed something. We both went for three courses, each dish as stunning as the other. For my mains I had the lamb cutlets, each bite as juicy as the other. The Gallery looked brilliant, there were endless sketches that I wanted to take home! I highly recommend a visit to this great restaurant. If I didn't know that Stanley Kubrick has long ago left our beautiful world, I would assume that this place's toilets are going to be one of his next movie's setting. Prepare your camera to take a shot of the most interesting - futuristic - artistic toilets you have ever seen. 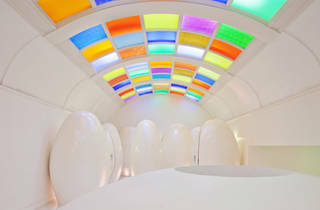 Several white capsules/eggs that cover a huge colorful space, will make you forget why you originally asked for toilet. Sketch gallery is the dinning room of a michellin restaurant placed between two different themed rooms for drinks. The gallery rooms itself is a piece of art, full of David Shrigley artistic touches. But you will come here for the food, not just for your Instagram addiction. Am I right? Having a 3 course dinner, I would say that food didn't meet my expectations. I would expect much more from a 2 Michelin stars restaurant, especially when it is so overpriced. Regarding service, everything was fine. Conclusion: I wouldn't suggest this place for dinning - but, for one or two drinks it would be fine. It was our second visit to Sketch and it only confirmed our previous feeling about this place. 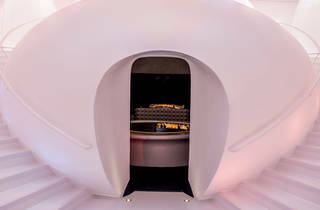 As a huge fan of Wes Anderson and David Shrigley, The Gallery is like a dream come through venue for me and the futuristic capsule toilets are legendary. I wish I was equally in love with the food, but unfortunately it is just OK. I gave it another chance, trying completely different dishes this time and I’m still not convinced. I ordered the ‘Homage to David Shrigley’ sashimi plate as a starter as I was expecting a deconstructed version of the known dish or an hilarious take on it. Instead, I got a boring plate of elegantly arranged pieces of food. The fish course consisted of literary 6 prawns with a bit of spicy sauce on the top, which were good, but nothing that I couldn’t eat in any good Spanish restaurant for far half the price. The desserts, that sounded least exciting on paper turned out to be actually the best of it all. What was supposed to be a Bourbon vanilla ice-cream was actually very nostalgic pink bubble gum tasting thing, floating in a white see of creamy milky soup. With sprinkles of pop candy and marshmallows, it was a true joy. What’s more, the staff seems to have a different approach to guests depending how posh they seem to be. We had booking for 6.30 and when we arrived 9 minutes too early, we were asked (and a few other people) to wait as the dinner service wasn’t apparently ready (although on their website it says the dinner service starts at 6pm). However, when a Channel dressed lady stormed the door, miraculously everything was ready! I used to really like this place. That is until they lied to me about why I could not take my leftovers (half a meal!) home to eat the next day, then cancelled my next reservation, and then blocked me on Twitter. Pink rooms call for girly afternoons, and what's more perfect for a girly afternoon than a spot of afternoon tea?! From what I can gather from other reviews below, the sweet delights menu changes some elements semi-regularly, but the gorgeous finger sandwiches remain at a constant delight! The assortment of finger sandwiches includes smoked salmon and Jacob’s cream, cucumber and ricotta, mozzarella and pesto, panini egg and mayonnaise with quail egg and caviar. Each of these unique pretty little sarnies are beautiful but dangerously light, so it’s not until your server asks if you’re *sure* you want another serving that you realise you’ve already eaten four plates of the things, and there’s still cakes to go! When it comes to the gorgeous cakes, the staple treats include macaroons, a pot of mouth watering mousse, home-made meringue, marshmallows, choux pastry buns and chocolate cake. On my visit, the choux buns were filled with something a bit boozy and the gorgeous pot of mousse a-top of the tower was citrus and tangy. As if the delicate cakes weren’t enough for you, you also get to devour a freshly baked, warm out of the oven scone with a HUGE spread of clotted cream and a generous splodge of strawberry or fig jam. I went for the fig, and had to ask for a second serving as I practically spooned it into my mouth! If you love tea, you’re in luck as you are spoilt for choice with the refreshing selection they have on offer. I opted for a pot of the Earl Grey Supreme and absolutely loved what was waiting for me at the bottom of the china cup when I finished. Where quirky and ridiculous meet posh and classy… If you think that’s impossible, simply pay them a visit. Designed by a few different artists, the place is incredible. It’s at the same time comfortable, classy and purely odd. The space itself is a beautiful 18th century townhouse with gorgeous glass ceilings, but the details are all quirky – the bill is written on sandpaper, the artwork on the wall is both rude and weird and the toilets are literally out of this world, literally – go check those egg-shaped survival pods at once. It’s quite a playful. Staff is amazing – attentive, polite and very helpful. Food is incredible, mostly French inspired but with international influence. Try the lamb chops – flavoursome pieces of meat that melt in your mouth. Desserts are fabulously presented with the right amount of bizarre to it (have you see the colour of my panna cotta? ), but unfortunately don’t taste as great as the rest of the food. You might then want to consider finishing your meal on a salty note to avoid any disappointment. Talking about the bill though… It’s quite expensive, so would only recommend it for some special occasion. But if you can afford it, you’ll be nicely pleased. Food was delicious and the art by David Shrigley was at least particular and interesting. My wife and I went to the sketch Gallery for our 9th anniversary as a couple as we had heard it was the new fancy place to go to. We arrived there just on time but unfortunately they didn't have a table ready for us (it was Wednesday and it was packed) so they kindly invited us to wait on the bar and have a drink. We were 10 minutes or so later take to our table by a very pleasant lady who apologized for taking so long. We ordered our food and they brought it quite quickly. I went for the tuna sashimi which turned out to be something closer to tiradito than actual sashimi. The fish was actually pretty good and the cheese in camouflage between the threads of cabbage came through very nicely. The dish was surprisingly big and the flavour of the avocado fit really well with the rest of the ingredients. However, after having half the dish you already start to feel it's a bit too much for a starter. For main dish (or maybe I should say seconds as the starter one could do as a main) I got the sirloin, medium-rare. Very tasty and well cooked. Nothing really special about the meat itself. The garniture was nice when eating it along the meat but not so nice if you dipped some bread on the remainders. Both my wife and I agreed that having some chuncks of rock salt on top of the sirloin would've made it a much better dish. In regards to the venue itself, I must say that the staff were very nice and helpful. It took a while for the sommelier to show up but as we didn't intend on drinking wine it did not matter to much to us. I found the place itself a bit too dark even for dinner. The place was packed so it being noisy was something to take for granted. But maybe the fact that people were taking selfies to show off rather than enjoying their meals made me feel the venue was more a place to go to just for posing than enjoying. Once the buzz has cooled down we might drop by again and enjoy the diner with less presumptuous crowd. My husband and I had dinner last week in this restaurant to celebrate our anniversary. Upon arrival the mâitre took care to call someone to take our coats and to ask the hostess to guide us to the bar as our table was't ready yet. We ordered some fancy mocktails (tasty but pricey considering they were basically a fruit juice mix) while we waited but less than 5 minutes later we sat down at our table. In general, all the dishes were quite good, unfortunately all of them had a tiny 'but' (i.e. my main veal course had some red cabbage on top that added nothing to the dish, and was too hard to eat, and my foie gras started had some tasteless jelly cubes). The room is gorgeous and very modern and because I personally love pink, I think that it's great, but for some people it might be a bit too much. The only problem with the decoration was the dim lighting, that prevent us from seeing the contents of our plates as clearly as we'd have liked. Finally, all the staff were extremely polite and pleasant, and even though the restaurant was full, we didn't need to refill the water in our glasses even once, or even flag down a waiter to ask for anything as there seemed to alway be somebody attending the tables around us. Overall was a great dining experience and we hope to go back someday, though we'll be more careful with the ammount of food that we order. Went here for a meal in the evening, and the venue is really stunning. Full of interesting art including loads of drawings by David Shrigley, which were fun to look at during the meal. The service was polite but a little over-bearing - I think we must have been stopped about 10 times during the meal to ask if everything was OK etc. The staff were friendly but it just became a but much! And the food was certainly tasty but I feel it was overpriced for what it is. The thing that tipped me over was a side dish of mac-and-cheese with truffle oil that we were encouraged to order to share. Without looking at the menu we agreed, assuming it was maybe around the £6 mark. We were shocked to be billed £23 for what was essentially a small-ish bowl of pasta. Must be some quality truffle oil! I'd say it's nice for a treat and for the interesting surroundings, but there are certainly better value places in the area. I had been meaning to go here for a long time as it looks stunning in photographs, and I finally got the opportunity to go this week. The venue did not disappoint at all, it looks just as beautiful i real life as it does in photographs, although it is noticeably dimmer in real life in an attempt to create ambiance. Although I knew it was an expensive place, I expected the food to match the price, and during my dinner I would have to say that it really did not. The food was lacking, and the service was not great. I think maybe I will return for afternoon tea another day just because I really loved the venue, but overall I was disappointed. There are certain luxuries in London that are a must, and this is one of them. I don't think of a room that has been this pink! Certainly still has the wow factor, great service, rich food, and great wine. Its a night you will remember for all the right reasons! My sister and I had high tea here as one instalment of my 30th birthday celebrations. Once we were seated, it took around 15-20 mins before anyone returned to take our order, and only after we had tried to catch the eye of several waiters as they walked past. I was a little disappointed with the service, although it did improve once our order had been taken. We had high tea with a glass of champagne, which costs a whopping £54 per person. Food consisted of a large plate of sandwiches (all cold except for one hot one), and a medium and small plate of sweet treats, like cakes and marshmallows. We were given a plate of hot scones (fruit or plain) with jam (fig and strawberry) and cream. Most of the food is unlimited, so we ordered an extra round of sandwiches, and left feeling totally stuffed. However, I wonder if I am the only person who leaves high teas feeling sick (not just from the food) that I have just spent over £60 (including service) on lunch that was essentially sandwiches and cakes? Why is this a thing? I think this will be my last high tea experience... Because for £60 I could get a pretty awesome dinner, or several amazing cocktails, even in London. An experiance to remember. Stunning interior. Wonderful staff and great food/beverages. I headed to Afternoon Tea on a cheerful weekday afternoon. Sketch’s Afternoon Tea begins as usual with assorted finger sandwiches.These include corn-fed coronation chicken, smoked salmon and Jacob's cream, cucumber and ricotta, egg and mayonnaise, quail egg, caviar and my favourite which was a warm mozzarella and pesto panini. Next we moved onto the warm scones which are served plain or with sultanas, served with clotted cream, fig and strawberry jam. We tried to pace ourselves as the waiter were kindly and repeatedly asking if we’d like anything and we didn’t want to overdo it before we had even reached the pastries. 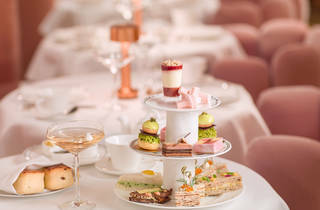 The Sketch Afternoon Tea pastries include passion fruit tartlet, lemon and raspberry cake, pistachio choux, blueberry cheesecake and finally a delightful chocolate and mint gâteau. These come with tangy citrus meringue and malabar marshmallow. The Afternoon Tea also includes unlimited amounts of tea, and all different flavours too. As a result I ended up trying quite a few different specialist teas such as phoenix honey orchid, jasmine pearls and silver needle. I had the pleasure of devouring an into the woods afternoon tea in the David Shrigley gallery (which is worth a visit alone as its hilarious). I'm not normally an advocate for egg mayo sandwiches but pair it with quail egg and caviar and I'm convinced, delicious. All of the cakes were divine and I'm not ashamed to say we asked for more. The selection of teas is superb and you don't have to stick to one as you can swap and change which is great. The waitresses were very charming and completed a brilliant afternoon. Dinner at the Galley at Sketch is a decadent affair. With aesthetic appeal and close attention to detail. 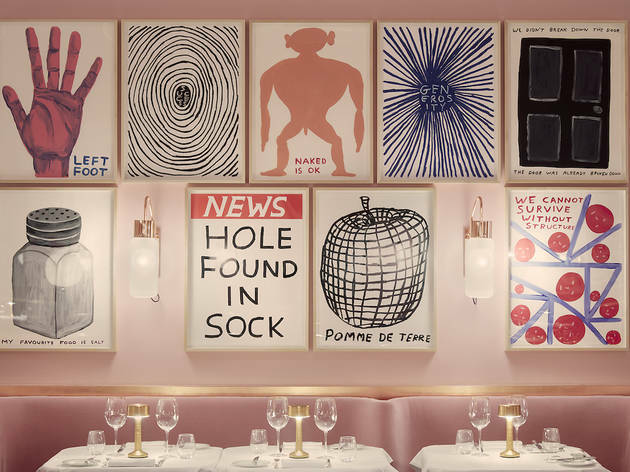 Walls are decorated in interesting prints from David Shrigley, distinctive crockery with a quirky menu to match this is definitely a must do although a little pricey experience in London. The first thing that strikes you is that it is all very pink. The food is delicious and very different to anywhere else I have experienced with an unusual mix of different ingredients all presented exquisitely. 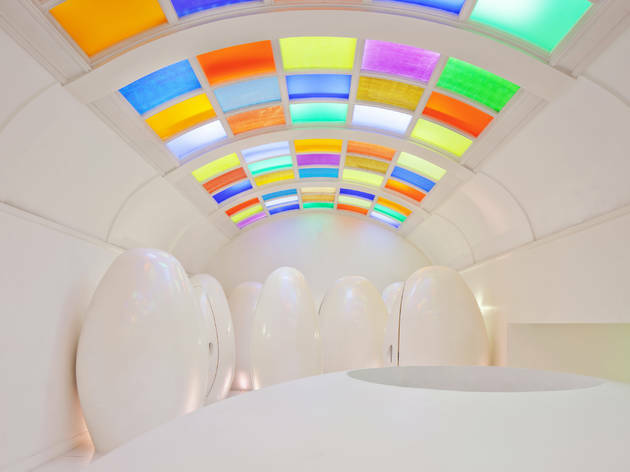 Also you must check out the washrooms with their classic egg shaped pods and multi coloured ceiling. Certainly some of the most interesting loos I have seen in a while. 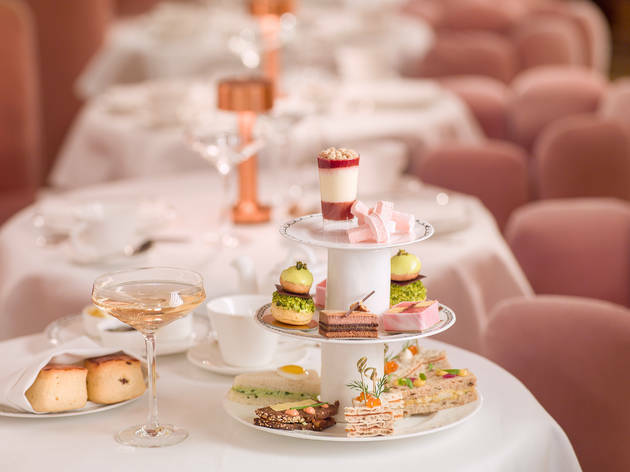 The Gallery no longer looks the same as the picture above, but has had an overhaul by Turner Prize nominated artist David Shrigley - hundreds of artworks cover the pink walls, and it's the perfect setting for afternoon tea. Highly recommend - some afternoon teas in London are tacky; this is far from it. 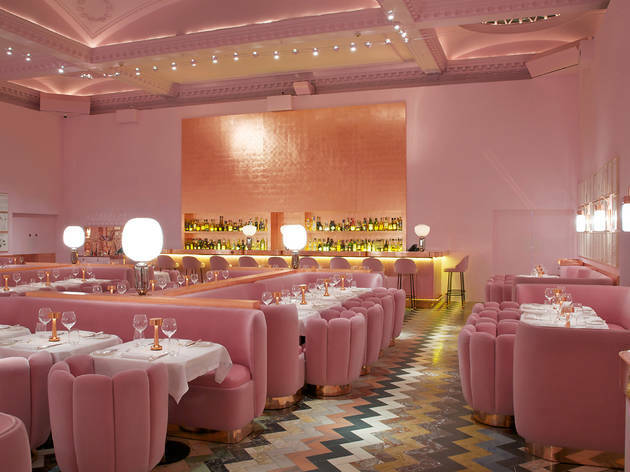 I found Sketch by Googling "strange restaurants London" in a frantic last-minute search for my birthday dinner venue, and boy am I glad it was as magical a venue as I was looking for. The first mystery: Where IS it? In place of a sign is a dog statue crawling down the wall. The interior is funky hotel chic, but with hopscotch chalked onto the floor. My mind continues to remain boggled at how the Gallery manages to look classy artsy even though everything is mismatched. Everything. Sofas and chairs, tables, glasses, cutlery, all bedazzled by a pepetual light show. It's what my ideal dining room would look like, only I doubt I can ever achieve its elegant modern wonderland-esque quirk. As for the toilets, I can only reveal that Sketch continues to impress, but I'll leave that particular surprise up to you to experience. While Martin Creed's atomosphere makes me completely giddy, I have yet to sample amazing food there, but only, I imagine, because it's a meat-heavy menu and I am vegetarian/vegan. That said, I haven't fully explored my options. I can, however, fully endorse the Sketchup. [homemade ketchup, in case you didn't get that.]. I send all London-bound friends to Sketch. It's fine dining, a top notch London adventure to be had. I couldn't disagree more with the comment from Antony. I have been here a few times and am a huge fan of the Afternoon Tea offering here. The quality of the food is impeccable, the atmosphere is always very good with people often in awe of the room decor and fabulous twist on the traditional English Afternoon Tea. The service is always very good and the staff are incredibly knowledgeable about the food they serve. They are also very accommodating for dietary requirements. I simply couldn't fault this place and is worth the extra few £s compared to mediocre restaurants. It's worth noting the decor is art and well inspired. I'm not sure they're going for 'ordinary' or cheap wine, which for many occasions is fine, but this is why chains exist. I would highly recommend this to anyone who enjoys great food. Very poor dining experience... generally overpriced, the wine (which cost over forty pounds for the bottle) was barely drinkable and the decor like waking up in a mid-60s nightmare, with extra pretention. Not going back any time soon. DISAPPOINTED! Service team and managers were terrible! We came just for drinks, stayed at the bar area only where I wanted to celebrate into my 26th birthday with a small group of friends. At some point, one of my friends led me outside because another friend was waiting there with a sweet air balloon saying 'happy birthday'. She was not allowed to enter with the balloon inside the 'oh so fancy sketch' because it does not reflect the environment (fair enough!). However, the way all of this has been communicated was incredibly rude and not the sort of level you would expect at such a place! (And we both know what we are talking about, both working in luxury fashion head office!) My friend started to cry because of the unfriendly interactions with the staff so I wanted to speak to the manager right away. He simply said 'I apologise for this', which he kept saying to me instead of apologising to my friend - but he clearly did not care so that was it for him. You would at least expect some sort of compensation but none of the sort! So we were forced to take the balloon to the cloak room. Wanting to try to make the best of the rest of the evening, we returned to our seats and you can imagine the daunting atmosphere all of us already had! Shall we stay, shall we just change venue? We stayed and the situation was not improved by having to wait forever to order drinks and then again having to wait forever to receive our drinks. At 11pm or so a waiter decided to bring me a happy birthday plate with a candle although my birthday wasn't until after midnight (and I am German and it is considered bad fortune to do this before your actual birthday!) So we did not touch the plate until midnight. At midnight, my friends then asked the staff if they could have another candle so we could do it properly. For some reason they wouldn't so that was just another bummer. Then, we observed the waitresses engage with other guests in the most absurd way, which got me thinking - I am not allowed to have a classic birthday balloon in the bar area because it does 'not reflect the environment' but the staff can act like monkeys? Ridiculous! I have always been wanting to go to sketch and I was super excited for this day! But no one looked after us properly, no one was accommodating us or tried to be pro active with us. It was a horrible experience and I did not enjoy my birthday at all! I am so disappointed and upset that sketch has ruined this occasion for me completely. Clearly well thought through interiors and many quirky features, a glam in-crowd, good music, a buzz to the place and friendly staff. Unfortunately the the food was truly dreadful- totally lacking any complexity or sophistication at best and sickly and unpleasant at worst. I'm sad to say some of the worst food we've eaten in a very long time, and at £420 for four adults and two kids not an experience to be repeated. I'd rather eat in KFC!